All SUNDANCE SQUARE homes currently listed for sale in San Antonio as of 04/25/2019 are shown below. You can change the search criteria at any time by pressing the 'Change Search' button below. 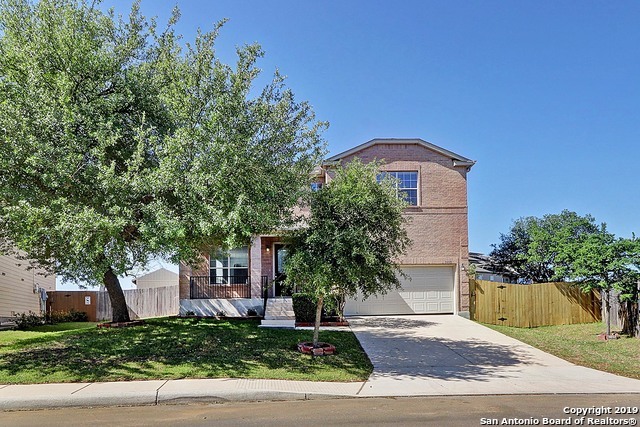 "THIS BEAUTIFUL, READY FOR MOVE IN HOME BOASTS AN ABUNDANCE OF MUST SEE FEATURES -NEWLY INSTALLED FLOORING, LARGE KITCHEN COMPLETE W/ STAINLESS STEEL APPLIANCES, DOUBLE OVENS AND OPEN TO MULTIPLE LIVING/DINING AREAS. SPACIOUS MASTER RETREAT DOWNSTAIRS. UPSTAIRS YOU WILL FIND AN ADDITIONAL LIVING SPACE, LARGE SECONDARY BEDROOMS AND BATHROOM. RELAX OR ENTERTAIN OUTSIDE UNDER THE HUGE COVERED PATIO OPEN TO THE LUSH BACKYARD. BOOMING LOCATION NEAR MAJOR HIGHWAYS, SHOPPING CENTERS, SCHOOLS & MUCH MORE"
"Beautiful huge corner. Walk into a spacious family room with high ceilings with upgraded 8 ft front door. The kitchen has nice cabinets with a back splash. This was the model which came with many upgrades from builder. The master bath has raised vanities with a separate garden tub and shower with tile surround. There is a covered patio, privacy wooden fence. and has a full sprinkler system, 4 sides brick."